The story was published in the October 2010 issue of Texoma Living! Magazine. Closed since 1980, the plant is now the annual Halloween home of Hatch and Kraven’s Slaughterhouse, which uses the building’s bloody past and unused equipment as inspiration for a half-hour tour of terror. Father and son owners Barry and Brad Travis, along with their extended family and friends, happened into both the business of haunted houses and the opportunity to start their own, and are constantly looking for new ways to terrify their guests. 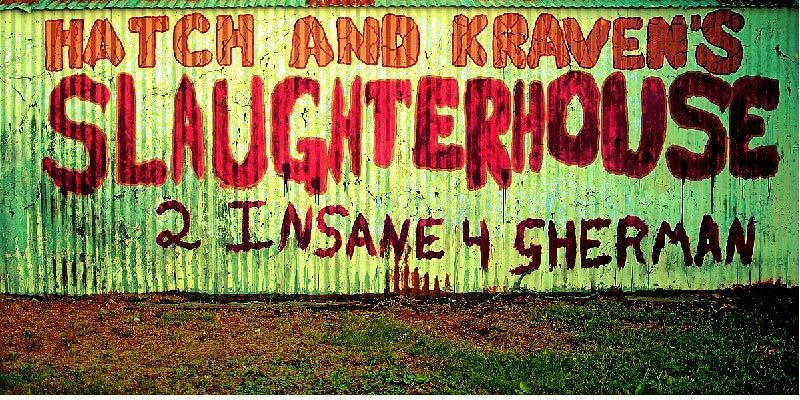 Hatch and Kraven Modair are the fictitious brothers whose slaughterhouse exploits are the backstory for the theme of the Travis’s haunted house. It all began eight years ago when Barry Travis was living in Allen, Texas and looking for a new job. “One of Brad’s friends was a mechanic at something called the Monster Safari­− the concept was you put people in trailers and they shot paintballs at monsters,” Barry recalled. The Travises worked at the safari for the next two years, under the direction of creator Allen Hopps, now the creative director of Screams, the largest haunt show in Texas. “He’s considered one of the best in the business nationwide, and he took Bradley under his wing,” Barry said. “He trained me in sculpting masks and props, and creating characters,“ Brad said. Chase’s dad, Jarod Anderson, was a descendant of the Anderson Meat Company founders, and when he and Barry got to talking about haunted houses at a campout things started cooking. It really took off when Jarod invited Travis to tour the old building. “This is a family affair,” Barry said, “Mason’s one of our actors, and our daughter Ashli is too.” Family friends have been a constant help along the way. Mazes occupy the area in which cattle were herded through chutes into the house, and “Hatch’s workshop” is on top of the former water troughs. A good haunt show has a theatrical core. “We have a storyline, we keep to it,” Barry said. “We’re a 1930s slaughterhouse that ran out of meat, the brothers went crazy, all the rooms and characters we have are based off that.” The characters spawned from the mind of Brad, literally harvested from his nightmares. “He does it like Stephen King, he dreams them,” Barry said, with a chuckle. “Part of what makes us unique is that Brad makes all our own masks,” Christie said. And making a mask is quite a process, as Brad explained. “There’s multiple ways of doing it depending on what you want to do. It can take twelve to eighteen hours to make a basic mask. The first year, I made eighteen masks. I make some different masks every year, and this year I’ve made eight new ones.” The family also makes all of their own props, and scavenge much of their set decorations and props from around the area. Hatch and Kravens is one of the state’s top horror houses. “We’ll find something on the side of the road and bring it up here, clean it up and repair it,” said Barry. The show hires an average of forty-five actors every season, and the show is known throughout Texas for the high quality of the acting. “We’re an old-fashioned haunt, we’re actor driven,” Barry said. 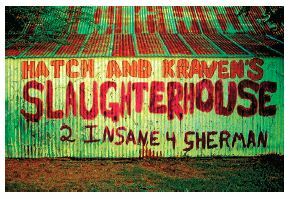 Hatch & Kraven’s Haunted House in Sherman is one of the top-rated houses of horror in the state. This is the best local haunted house ever!!! Please always stay open!! I appreciate all the hard work yall do to keep us scared!! From time to time we hear about a “puppy mill” being closed down. One man arrested said, “You can’t take them. Them’s my money dogs!” Texoma Living! implores you to avoid buying curbside animals and make the trip to one of the area animal shelters, instead. On a cul de sac street in a quiet west Denison neighborhood is a place crawling with bikers. Tim and Cathy, in their mid-forties, have so many motorcycles that they have their own mechanic’s shop right on the property. They also have two four-wheeler ATV’s. One of Texoma’s underappreciated gems is the Hagerman National Wildlife Refuge in the west central part of Grayson County along the Big Mineral Arm of Lake Texoma. Regardless of the season, the refuge is either home or a waypoint for hundreds of species of wildlife and migratory birds.